Hair Transplant is a surgical procedure to restore natural hair back on the bald area of the scalp. It is also done for reconstruction of beard, moustache and pubic hair. The hair roots are taken from the back side of the head (occipital area), this is the permanent or safe zone from where hair does not fall as they are not having receptors for androgen. When we transplant these hair roots in the front area of scalp they do not change their nature and are permanent. If a person is of the higher grade of baldness (Norwood grade VI and VII) he may need some extra donor source other than scalp to cover his bald area, here Beard and chest is taken as a donor source. When a non-scalp area of the body is used as a donor or recipient this is known as body hair Transplant. If the hair transplant is done without damaging hair roots, its result is very good. Transplanted hair roots start growing after 3-4 month of hair transplant so for good result we need at least 6-8 months. For natural looking result design of Anterior hairline is very important, It is the signature of the surgeon on the patients head. 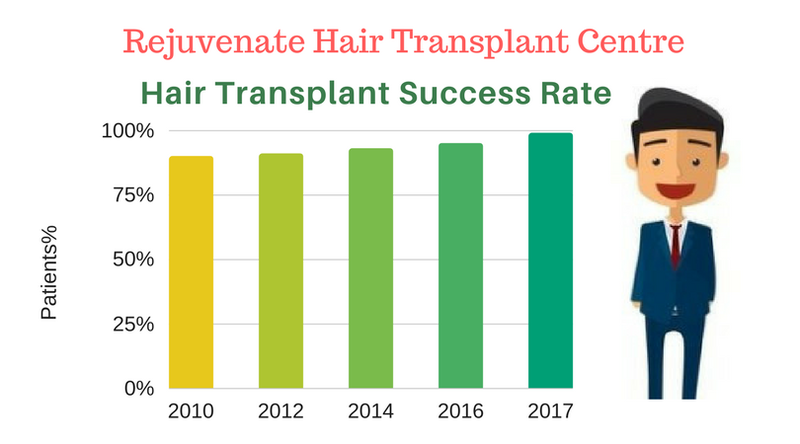 At rejuvenate, hair transplant centre Indore natural results of hair transplant are so natural looking that nobody can make out if the transplant is done. Usually, hair transplant is a very successful procedure provided done by a trained experienced qualified surgeon. Hair transplant success depends on many factors. The extent of existing hair loss and availability of donor’s hair. The quality of the donor’s hair also affects the result of hair transplant.If patient donor hair is thick and slightly curly the visual impact of density is more as compared to thin hair. After hair transplant the length of hair should be kept little longer so same hair can cover more area. Surgeons experience, his technical expertise, minimal trauma to delicate hair follicles, out body timing of hair follicles, graft holding solution, the expertise of assistant, instruments are very important factors which contribute to the success of hair transplant. Why is Hair Transplant Best Option? Androgenetic Alopecia becomes very distressing for some patients especially if it occurs in early age group (20 to 30 year of age). this is the time of image building of a person. I have seen many young boys who go under depression because of their hair fall and stop meeting with people. Artificial hair in any form whether patch or wig gives unnatural look and person may become more conscious if someone asks them about this. They also need maintenance and may lead to some skin problems as are unhygienic. So, Hair transplant is the best option for baldness it is the procedure by which you can get your natural look back. It is a one-time expenditure but then becomes maintenance free, grow naturally and are a permanent solution for the baldness.no body can make out that your hairs are transplanted or natural ones. Cost of hair transplant varies from place to place and surgeon to surgeon. Usually, cost depends upon a number of hairs or graft. The result of a hair transplant is also related to the number of grafts implanted. Donor area of the scalp is limited So if some clinic claims that they provide unlimited hair transplant it is wrong. Hair transplant is a teamwork it requires dedication of all the team members, staff should be well trained. If a hair transplant centre is equipped with all modern facility with full-time staff, a cost may be more but the result will also be better at such places. Hair transplant is the transfer of hair root from one part of the body to another, for example, occipital area to frontal area of the scalp, beard to scalp, scalp to beard etc. 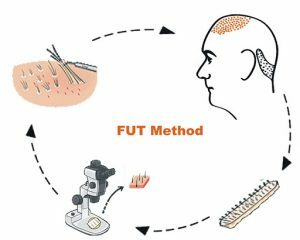 Mainly there are two techniques- FUT is a follicular unit transplant and FUE – follicular unit extraction. There is a common myth that FUT is the old procedure and FUE is a new procedure which is not true. both the techniques are good. A hair restoration surgeon should have experts in both techniques. He must utilize these techniques to get maximum benefit in favor of the patient. So, if the grade of baldness is more combination of FUT and FUE along with BHT can be done. At a young age with a strong family history to lose hair, only FUT can be done. If a surgeon knows both techniques well and not biased for any technique he will take the best decision in favor of the patient. FUT is also known as Strip Technique. A skin strip is taken from the back side of the head which is the safe zone or permanent zone of the scalp and then individual hair follicle is dissected under the microscope. The advantage of this method is when we take a strip of skin this is the most permanent zone or also known as the sweet area as foe as donor area is concerned. So, these hairs last for maximum time may be up to the age of 80. Usually, in young age, FUT should be preferred but if a person wants to keep his hair short, he may go for FUE also. FUE is more commonly done now a day as nobody wants a linear cut on the back of the scalp. In FUE Hair Transplant technique individual follicle is taken out from the donor area with the help of a punch. Punch can be done manually or with the help of a motorized device. This procedure totally depends on surgeon expertise as it is a blind procedure. If a surgeon is not trained enough hair roots may be transacted and will not grow after implantation. This is a permanent loss of a hair follicle so before going for hair transplant you should inquire about surgeon qualification. In FUE small circular scars are formed on the backside of the scalp but these are not visible. 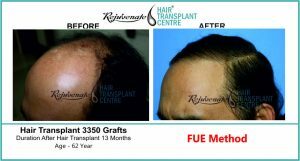 At Rejuvenate Hair Transplant centre ultra-sharp punches are used and they are of a very good quality so leaves negligible scarring. When the non-scalp area of the body is used as a donor or recipient this is known as body hair Transplant. This technique is a basically advanced form of FUE. Results are good and is mainly used in grade VI and VII patients. Beard and mustache reconstruction (after cleft lip scar) is also done successfully by this method. Chest hair gives good filling effect when used with scalp hair. Beard hair are thick so they should not be used in the anterior hairline zone. We usually mix beard hair with scalp and then implant them on the mid-scalp area. 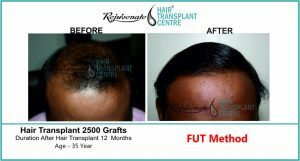 At Rejuvenate hair transplant centre we give a guarantee of result. We use No touch to root technique for implantation to avoid micro damage to the hair follicle. Also, we use plasma as a graft holding solution to provide a biological atmosphere to the graft outside the body. The Result of hair transplant is permanent in nature if done properly. When Hair roots are implanted they start growing within 3-4 months and then grow at their normal rate ie 1 cm per month. Normally roots are taken from the backside (occipital) of the scalp. These hair roots are permanent, but if Hair roots are taken by FUE from non-permanent part of scalp then they may fall in the normal process. There are two important things about the hair transplant surgeon. First is the Qualification of a doctor. The qualification of surgeon shall be recognized by medical council of India as well as he should be illegible to do hair transplant also. Another important factor is the experience of the surgeon for hair transplant. Many times doctor might be qualified to do hair transplant but he is not having experience of it or might have just started without much of training. So qualification and experience of hair restoration are must for a good hair transplant surgeon.